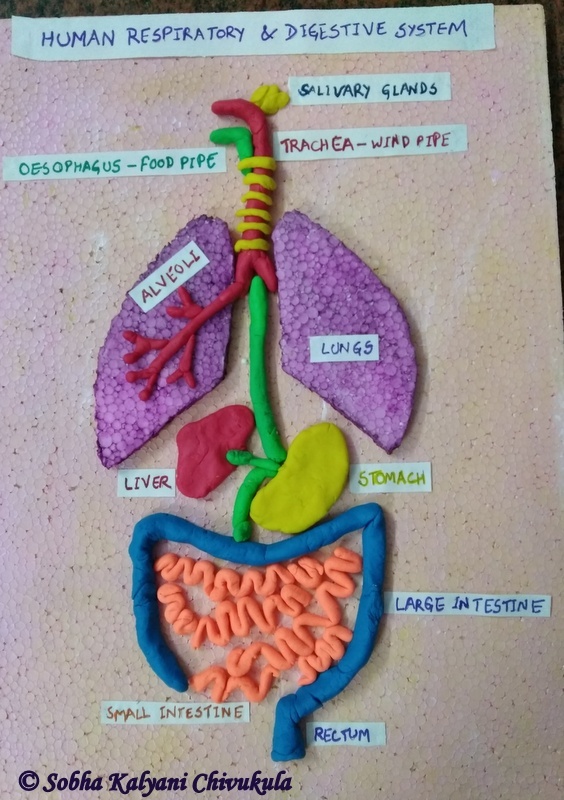 The above model of human respiratory and digestive system was done by my daughter studying in Class 3, of course with my assistance. I very much care for our environment and am against the use of non-biodegradable materials. I always go for eco-friendly practices. However, it's easy to use and make models on thermocole by small children and also easy to carry by them, though it is a non-biodegradable material. In the above model, I took a rectangular piece of thin thermocole for making the 3 D model. I helped my daughter to paint with light color on the thermocole. I, then, drew the shapes of lungs on another small piece of thermocole and cut it across the outline. My daughter painted the lungs in dark color and she stuck those with fevicol at the proper place on the thermocole. For the other organs of the systems, I used synthetic clay i.e different colors play dough. My daughter molded the dough into desired shapes and stuck those at the appropriate places on the sheet with fevicol. And finally, she wrote the heading of the project, labeled the parts on thin strips of paper and stuck at proper places with glue. That's it, the 3 D model of human respiratory system and digestive system is ready for submission. It's that easy to make with a beautiful look?